I‘ve just received an email from YouTube. It informs me and millions of others, that we are being dumped from their advertising program. This apparently is to stop ‘spammers, impersonators and other “bad actors”‘ from making money from their ‘eco-system’. YouTube have emailed again today to confirm the cessation of advertising revenue. The rollout of these changes was documented by Ken Heron on his YouTube channel where advertising was removed from his videos according to his dashboard. Ken meets with YouTube’s new rules and should in fact continue to receive monetisation. YouTube’s most recent letter confirming removal of monetisation is below. Whilst my Youtube video’s are in no way Studio Quality, they are not Spammy, Impersonating anyone or re-uploading video (unless where permission is giving such as SpaceX). In reality, they are removing the ability for non-professionals to make any kind of money from their advertising platform (I can tell you it is a very small amount). Big Hitters such as MKBHD and Casey Neistat will continue to reap the rewards of monetisation leaving the less fortunate ‘potless’. Simply put, people such as Casey Neistat, Marques Brownlee (MKBHD) and other extremely successful ‘YouTubers’ will continue to rake in millions in advertising revenue, whilst the less fortunate will lose all forms of income from this platform. Whilst there is nothing wrong with being paid for high quality content, successful YouTube creators also earn massive amounts of revenue from advertising and affiliate links. Basically they continue to get the best of all worlds, whilst the less fortunate get completely cut off. In all honesty my videos on YouTube make a pittance through advertising, however I also have a Patreon channel. This is a 3rd party channel which many YouTubers current use to make a sensible living through their hard work. If you feel somewhat inclined to support The Gadget Man site and Youtube channel, you can use Patreon to do this. Not only will this help encourage me to produce more content, it will also help towards buying better equipment to produce content. YouTube is owned by Google who’s corporate code of conduct is Don’t Be Evil. “2017 marked a tough year for many of you, with several issues affecting our community and the revenue earned from advertising through the YouTube Partner Program (YPP). Despite those issues more creators than ever are earning a living on YouTube, with the number of channels making over six figures up over 40% year-over-year. In 2018, a major focus for everyone at YouTube is protecting our creator ecosystem and ensuring your revenue is more stable. Welcome to the 100th Episode of The Gadget Man, this time I set myself a very big task of LIVE STREAMING a technology review of the brand new Cross Peerless Trackr Pen. I hope you enjoy it below. The review itself starts at about 2 minutes in! A few weeks back I was invited to London to attend the launch of the new Cross Peerless Trackr, the worlds first trackable pen. Cross have been making writing instruments since 1846, so it was a pleasant surprise to see an established traditional brand embracing technology without losing what makes the company appealing. The pen has Bluetooth technology carefully embedded inside it which works alongside what’s called ‘Crowd GPS’. This means that if you are unfortunate enough to misplace you pen or worse have it stolen, a league of other Trackr users immediately start helping your reunite your prized pen. When a person running the Trackr app comes within up to 30 metres of your pen, they detect it and immediately an anonymous message is sent to you informing your of it’s current position. Upon receiving the notification, you can then go to that location and using the app on your own phone, you cause the pen to light up and sound an alarm to give you an indication of it’s exact position, after a little bit of searching or discussion with it’s new temporary owner, the pen can be returned to you. Conversely, the pen itself can be used to locate your phone, so if you are hunting around the house in the morning for your mobile, simply hold down the button on the side of the pen and your phone will start ringing! The pen itself comes in a very nice presentation box along with instructions for pairing and using the pen, spare batteries, a nice suede case sleeve for the pen and your guarantee from Cross. Once taken out of the box, the pen feels just weighty enough to feel comfortable and writes smoothly. As a pen on it’s own, it was nice and of course the ‘techie’ addition of the tracking appealed to me too. You should bear in mind that the crowd GPS functionality requires a ‘crowd’, so losing it in the middle of a deserted field isn’t going to help. Saying that, most towns have a large number of Trackr users and Central London was packed with them. You can even see how many people use Trackr by visiting their website. If you are looking for a high end pen for meetings or a nice birthday or anniversary gift for someone, look no further than the Cross Peerless Trackr 125 Pen, available from all good pen shops for around £212.00. Thanks to Rachel and Dan at Small Man Media and of course Cross for their kind invitation. Earlier in the year, we reviewed the Kodak PixPro SP360, we thought it was a superb camera capable of recording YouTube compatible 360 movies, so we’re really pleased that Kodak have announced an upgraded SP360 which is now capable of recording in 4K. The original SP360 was capable of capturing video in up to 1440×1440 HD, this video was then unwrapped to product scrollable 360 video which could be uploaded to YouTube and viewed interactively. 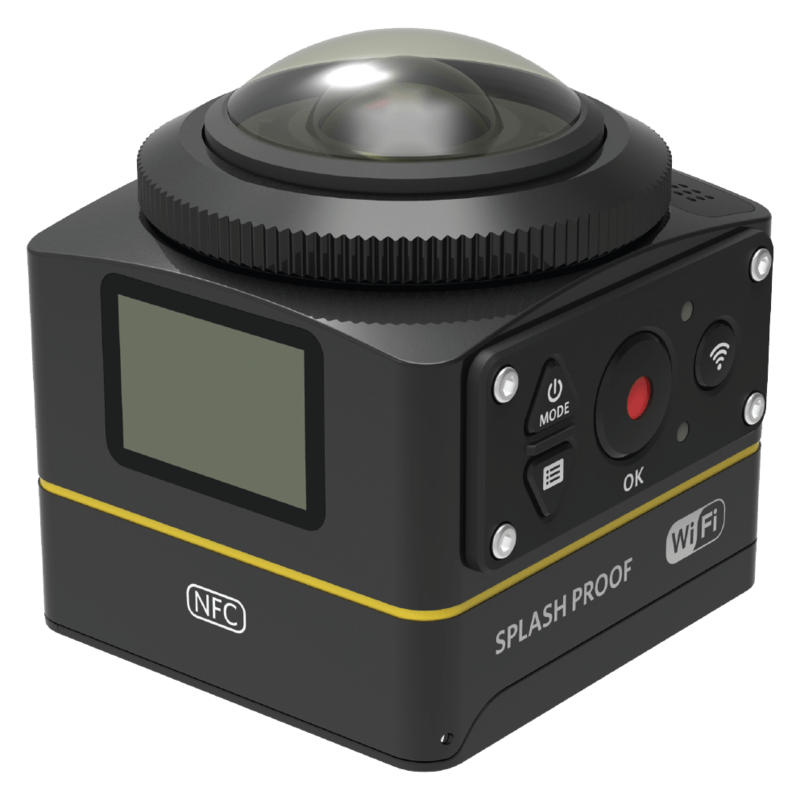 There has been a great deal of excitement concerning the KODAK PIXPRO SP360 Action Camera and it’s been popular in the tech press and TV, this has placed Kodak at the forefront of this technology. The SP360 4k Camera captures 360-degree field of view in multiple directions via its dome shaped lens design and can be panned not only 360-degrees horizontally, but also up and down with a host of different vantage points and views for playback post capture. At the official press launch, Mariame Cisse, Marketing Manager of JK Imaging Ltd said “The KODAK PIXPRO SP360-4K revolutionize video recording and how you see and experience the World All Around You. This is the next step to Evolution for 360 degrees Cameras. You can now create the most pristine videos and photos in 4K and Direct and Act your own Virtual Reality movie”. Hopefully we will have a chance to try out the new features soon including the live broadcast features. Like many, we are really looking forward to the next trilogy of Star Wars movies coming our way, starting in December 2015 with Episode VII The Force Awakens. The new trilogy is being directed by J.J. Abrams, who is famous for adding plentiful lens flare into his movies. There’s been much discussion on Twitter and Facebook about whether the new Star Wars movies will inherit this trait along with maintaining the visible style of the previous ‘Hexalogy’. Right up to the release of the teaser last week YouTube became awash with fan made versions, some good and some bad, we’ve added a selection of the above, including the official version with added lens flare and George Lucas’ ‘Special Edition’. If you have found some Star Wars Episode VII The Force Awakens teasers that you think should be added to the list, include them in a comment below!! We filmed part of the Renault Zoe test drive last week and have finally managed to get it uploaded to YouTube.